It wasn't exactly a profile in excellence as the host Chicago Bulls struggled to shoot the ball and were mired in 15 turnovers against the Detroit Pistons Friday night at the United Center. But following a pattern they've established all season, the Bulls once again found a way to win. This time, they relied on a solid defensive effort that held Detroit to 10 fourth quarter points and paved the way for a hard-earned 83-71 win. "Our defense and rebounding carried us, like it usually does," said streak-shooter Kyle Korver, whose Bulls badly outrebounded Detroit, 53-37, while holding the Pistons to just 31-of-84 from the field (36.9 percent). Derrick Rose missed his eighth consecutive straight start and his absence obviously factored in his team's erratic play. The Bulls sank only 32 of their 75 field goals (42.7 percent) and they clanked 10 of 12 three-point shots. They also missed four of 21 free throws. The Pistons went off the a quick start and seized an 18-10 lead when Brandon Knight drilled a 3 at the 5:57 mark of the opening quarter. But the Pistons offense turned cold as they watched the Bulls retake the advantage after the first stanza, 28-25, before expanding it to 44-35 by halftime. 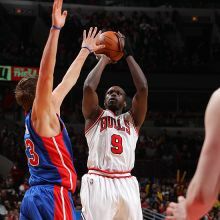 Luol Deng led all scorers with 20 points on 8-of-15 field goals. The 6-foot-9 Duke alum made all of his four free throws and also had nine rebounds and three assists. Joakim Noak backed Deng up with 19 points and 12 rebounds while Carlos Boozer added 13 points and 11 rebounds. C.J. Watson, manning the point without the injured Rose (strained groin), finished with 11 points and five assists. Detroit settled to being just a jumpshooting team, rarely penetrating and going to the free throw line just seven times. The Pistons converted only 3 of 11 threes and their ball movement often stagnated, yielding just 15 assists against the Bulls' 22. Scoring a mere 10 points each in the second and final periods sure didn't help. Brandon Knight paced the Pistons with 16 while Greg Monroe and veteran Tayshaun Prince contributed 14 apiece. Austin Dye had 11 while Jason Maxiell added seven for Detroit, which dropped further out of the playoffs picture with an 18-33 won-lost record. The Bulls, meanwhile, remained on top of the NBA with a league-best 42-11 slate. They play the 39-12 Thunder Sunday afternoon in Oklahoma. TIDBITS. Bulls head coach Tom Thibodeau denied an ESPN.com report that said he was "dismayed" by the lack of progress concerning his contract extension. "I don't know where that's coming from. I'm not worried about any of that stuff. I'm under contract. I'm fine with everything here," Thibodeau told reporters.